My wife and I got spammed on Jackfish Bay on our last canoe trip. No, I didn’t have a computer; I saw a plastic bag in the forest behind the campsite, and it had three full cans of SPAM, the real deal. Minnesota is the Spam capital of the world; for those who don’t know the etymology, it is shoulder of pork and ham. When I first canoed, 50 years ago, Spam tasted pretty good. Then again, in the woods, most things taste good, even pine needles. On the same campsite were two empty beer cans and a burned out can in the fire area. We carried all of this garbage out, along with our trash. 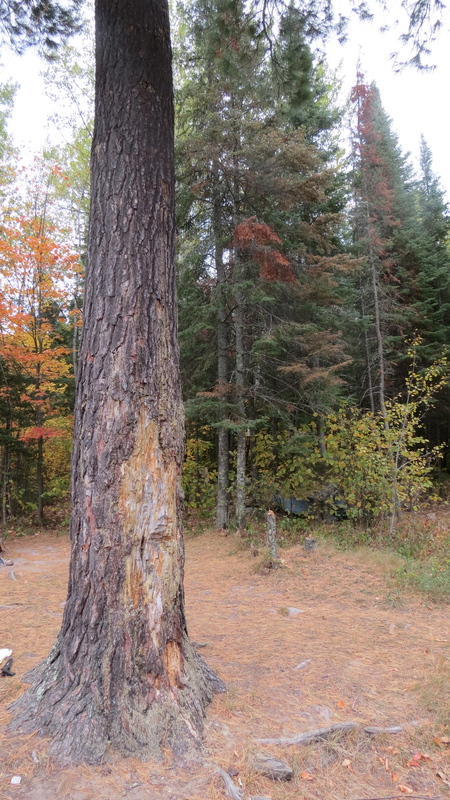 The white pine in the center of the campsite had dozens of scars from people who had to chop at it. Despite that, the tree was tall and had no signs of blister rust, unusual for a tree this age. White pines are the most beautiful tree in the woods; the wood from them is prized. Why anybody would deliberately chop at a tree that was likely a sapling when the Voyageurs came through 225 years ago is beyond me. White pine (Pinus strobus), scarred by prior campers. But, give a guy (usually a guy) an axe, and everything in the woods becomes fair game. On the way out of the woods, we passed a campsite where somebody had cut a few dozen balsam pine boughs for a mattress. There was a time, half a century ago, when we cut balsams down for tent stringers, used their boughs for mattresses, put cans in the campsite can pit (or in the lake), and threw axes at trees. These days I thought were gone. Having cleaned some 500 campsites in the Boundary Waters, those days are not gone. Note to campers: aluminum foil does not burn completely in campfires. No, it does not. The Wilderness Act of 1964 establishing the Boundary Waters (BW), made most of it, except for a few lakes, including Basswood, non-motorized. Cans were not allowed, green trees were not allowed to be cut (they don’t burn, and there is no reason to do so), permits were required (and were free for more than three decades), and the number of people who could congregate at one spot was limited to 9. The BW was and is the largest roadless area in the contiguous states. This did not sit well with some, and Sig Olson, one of the first great wilderness writers, was burned in effigy in his hometown of Ely. Sig knew, far before many, that wilderness was no longer something to be conquered or to be lived off but something to be protected. It was a massive shift in thinking that many still have not embraced. We now have lightweight and safer gear: air mattresses, chairs, small saws, rain suits, good tents, barbless hooks, food packaged in plastic, but not metal, that it ought to be easy to travel in the wilderness without harming it. I write this to those who do not know the rules but wish to abide by them; I hope maybe a few of the others might think about what they are doing as well. The BW is not pristine America post-glacial era. Most has been logged, about a century ago, and it has been burned by natural and human-caused fires. I’ve seen a third of the campsites with hot ashes or frankly burning fires and no inhabitants. I’ve seen many other fires built outside the fire area. Given the dryness of the soil–dig a latrine, as I have and you realize this fact–fires can spread underground. Fire is a natural phenomenon, lightning sparked fires, such as the Pagami Creek Fire last year, clear the forest for new growth. The debate should be about whether we let naturally caused fires to burn. There should be no debate whether somebody should be allowed to leave an unattended campfire. The BW is open to fishing and hunting. Fishing has to change too, from a half century ago. Catching large stringers of fish–or one huge fish, a breeder–has to stop, and catch and release, except for a meal, with barbless hooks should be done. Is this inconvenient? Sure. But what about the upcoming generations? BW lakes are not sterile, but the northerly climate makes them far less productive of fish than many lakes at lower latitudes in the US. Wilderness is not only subject to attacks from within but from without. Fish have mercury, lakes become acid. Water quality may deteriorate from sources far from the wilderness. Careless boaters can transfer invasive species from one infected lake to a previously normal one. Heavily log or burn much of the forest, and streams and lakes will become muddy. This affects fishing. Eventually, such damage may clear. Mining, on the other hand, is forever. A sulfide mine, planned near the wilderness, is a huge concern. Communities need jobs, but sulfide mines are particularly toxic to watersheds, and the BW is a watershed if ever there was one. Another pillar of the local economy is tourism. Destroy the watershed, and tourism will disappear. I am told the mine will be safe; things tend to be “safe” until they are suddenly not safe. Then, everybody is sorry, the money made, the rich folks gone. One hundred fifty years ago, the virgin pine stands of northern Minnesota were thought to be inexhaustible. Forty years later, the state was importing lumber. Log enough, and the jobs eventually end, along with the forest. Mine enough, the jobs eventually end, along with the surrounding area. If we have an unemployment problem, one good solution would be for many families to have a lot fewer children. The US population has more than doubled in my lifetime; we have one of the highest birth rates in the industrialized world. This is the 21st century, and we need natural resources, wise use of land, and a lot fewer people than we are producing. If we continue to act the way we did in the 18th century, nearly exterminating the beaver, the 19th century (the buffalo and the forest), and the 20th (treating wilderness like a playground), there will be a large emptiness in the 21st. Nature can recover, but within limits, and often with very different outcomes than even the best biologists can predict. Enjoy the wilderness, carry out what you brought in, and maybe a little stuff that others brought in, too. This entry was posted on September 27, 2012 at 09:04 and is filed under BWCAW 2012, UNPUBLISHED OUTDOOR WRITING. You can follow any responses to this entry through the RSS 2.0 feed. You can leave a response, or trackback from your own site.